Hearst Castle in San Simeon, Calif., was the model for Charles Foster Kane's palatial estate, Xanadu, in Citizen Kane (1941). The castle, owned by newspaper magnate William Randolph Hearst, was also a gathering place for the old Hollywood elite in the 1920s and 1930s. 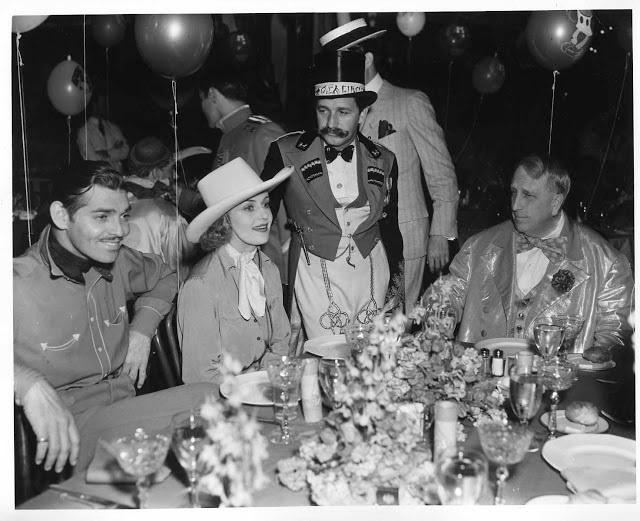 Here's Clark Gable (far left), Carole Lombard, producer Mervyn LeRoy (standing) and Hearst (seated, far right) at the famous circus party in 1938. One of the most memorable elements of Citizen Kane (1941) is Charles Foster Kane's palatial estate of Xanadu. The newsreel that opens the film (clip below) describes the mansion on the "deserts of the Gulf Coast" as the "costliest monument a man has built to himself" filled with priceless artwork stored in crates and a zoo filled with exotic animals. Xanadu is depicted as a lonely and forbidding place. Kane's second wife, Susan Alexander (Dorothy Comingore), feels imprisoned in Xanadu, calling it "49 thousand acres of nothing but scenery and statues" while she endlessly works on jigsaw puzzles to occupy her time. Hearst Castle in San Simeon, Calif., built by newspaper magnate William Randolph Hearst, was the model for Xanadu. Director Orson Welles and screenwriter Herman J. Mankiewicz did accurately capture some parts of Xanadu -- the private zoo, crates of priceless artwork, jigsaw puzzles -- but Hearst Castle was filled with life and laughter and Hearst himself was a generous man who loved to throw lavish costume parties for hundreds of guests. Hearst Castle sits on top of a hill in the Santa Lucia mountain range. Hearst Castle is built on 250,000 acres in the Santa Lucia mountain range. The mansion itself is situated on a hilltop overlooking the Pacific coast. Hearst's father, George, purchased the land in 1865 and built a lovely, but modest ranch house on the property. When Hearst inherited the estate in 1919, he decided he was tired of "camping out" in the ranch house, so he hired noted architect Julia Morgan to create a lavish retreat that Hearst called La Cuesta Encantada, which is Spanish for enchanted hill. 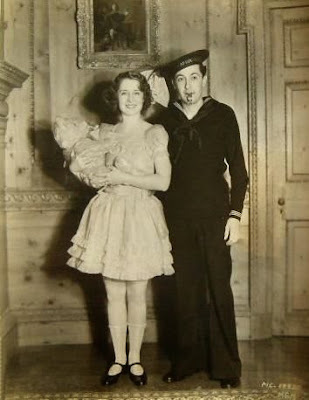 Norma Shearer and her husband, producer Irving Thalberg at one of the lavish costume parties at Hearst Castle. Morgan and Hearst worked together to create the 165 room castle, with three guest houses, two pools and 127 acres of gardens and trails. The gregarious Hearst loved entertaining, first with his wife, Millicent, and then with his companion, actress Marion Davies. Everyone who was anyone spent the night at Hearst Castle, including presidents Franklin Roosevelt and Calvin Coolidge and British Prime Minister Winston Churchill. Hearst loved show business and most of old Hollywood's elite visited Hearst Castle. Charlie Chaplin was a regular guest and Joan Crawford, Bob Hope, James Stewart, Cary Grant, The Marx Brothers, and Citizen Kane screenwriter Mankiewicz (that's one invitation Hearst wished he never sent) all spent time at Hearst Castle. 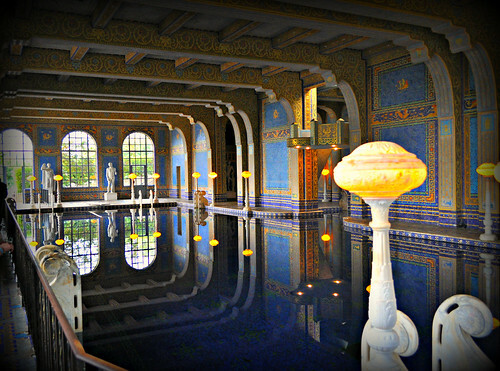 The Roman bath at Hearst Castle. Guests at Hearst Castle were free to do what they pleased during the day. The castle offered plenty of diversions including a lavish billiards room (W.C. Fields favorite), horse riding on mountain trails, or swimming in two stunning pools based on Greek and Roman designs. All guests were required to attend dinner with Hearst and Davies in the evening. Hearst sometimes showed movies after dinner (the conservative Hearst cut out all kissing scenes), but he also enjoyed hosting elaborate costume parties. Hearst loved picking out themes for these parties, and he personally selected the costumes for each guest, which were made by an army of tailors and seamstresses on Hearst's payroll. The high point of Hearst Castle was the famous circus party celebrating Hearst's 75th birthday on April 29, 1938. Here's a link to some great archival footage of the party. 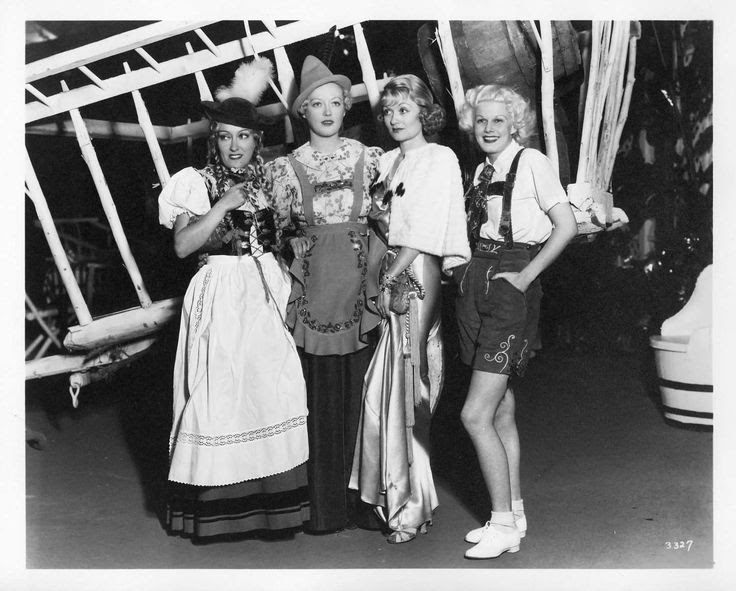 Gloria Swanson, Marion Davies, Constance Bennett and Jean Harlow at a costume party in Hearst Castle. Hearst Castle declined after Citizen Kane was released in 1941, mostly because of Hearst's failing health. After Hearst's death in 1951, his heirs gave the estate to the California Park Commission. Hearst Castle opened for tours in 1958 and it is still a popular tourist destination today. You can find out more here. The video below is a full-length program on Hearst Castle. Hearst Castle was not used for any location shooting in Citizen Kane. In fact, Hearst Castle has only appeared once in a film: It was used for Crassus' villa in Spartacus (1960). Welles used matte paintings and newsreel footage of Oheka Castle in Huntington, N.Y., for Xanadu. Welles also shot quite a bit of footage in Balboa Park in San Diego, which he cleverly disguised to make it look like a palatial home. This local news clip shows the San Diego locations in Citizen Kane.